My family overdid the dessert thing during Christmas week. We were lucky to receive plate after plate of delicious goodies from friends and relatives. Meaning we all ate a ton of cookies, cake, candy, and other snack foods for days on end. You too? Yep, I thought so. I went to the farmers market this weekend and loaded up on greens. Beet greens, kale, and a huge bunch of Swiss chard that was so big it didn't fit in the refrigerator. I stripped the green chard leaves from their ruby-red stems, chopped the leaves, and cooked them for just a few minutes with a little olive oil and garlic. When they were cool I mixed in eggs, crumbled feta cheese, shredded mozzarella, chopped green onions, and a little Bisquick to bind everything together before baking in a casserole dish. 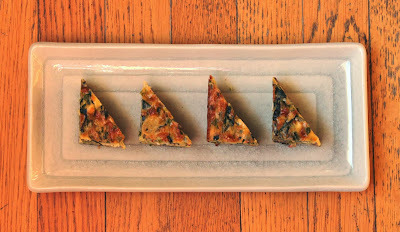 The result: a firm, nutrient-rich snack my family loves. I've served this in squares for breakfast and lunch. I've cut it into small triangles or batons and put it out at parties. No matter what shape you serve it in, I guarantee good results. 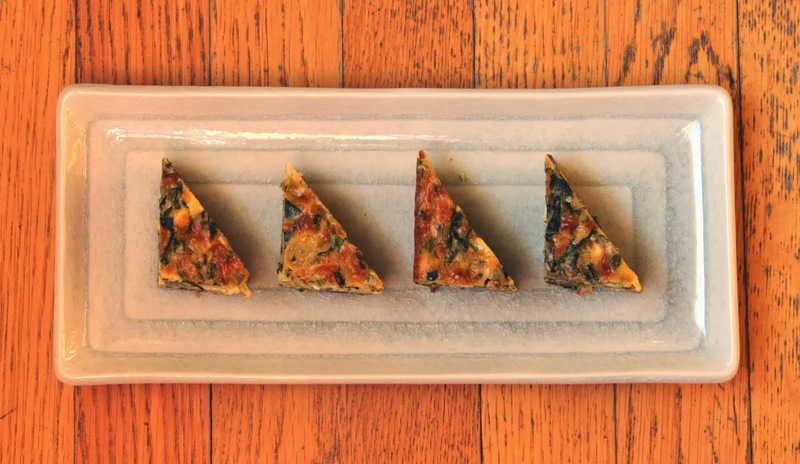 This nutrient-rich snack is packed with healthy Swiss chard. 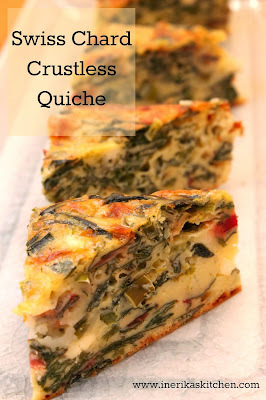 Serve it at breakfast or lunch, or cut it into small triangles or batons as a healthy finger food appetizer for your next party. Heat the oven to 350 degrees. Spray a 9x12-inch baking dish with nonstick cooking spray.Heat the olive oil in a large skillet over medium-high heat. Add the chard and garlic and saute about 3 minutes, until chard is wilted but not mushy. Pour the chard mixture into a large mixing bowl and let cool 10 minutes.Add the eggs, cheese, green onions, dill, Bisquick, pepper, and salt. Mix thoroughly until well combined. Add the milk only if the batter seems dry or extremely thick. Pour the batter into the prepared baking dish.Bake about 40 minutes, until the quiche is set in the middle and the top is golden brown. Cool in the baking pan. Cut into squares, triangles, or batons to serve. Wow, do those ever look delicious! And you're right...after the week of fancy eating we just had, we need to concentrate on nutrition, too. For those who want to save a little time, you could make this with a bag of our already triple-washed and chopped chard -- white, red or rainbow! @Dorothy thanks - yes, it's really pretty! That's what I love about chard, the little bit of pink that remains. @Cut 'N Clean yes, this would absolutely work with your bagged chopped chard. Rainbow would make it the prettiest. @Libbety thanks for sharing the recipe with your readers!